SHADES of Al Capone. Even the bootleg king’s old town of Cicero, Ill., finally has hung up its tommy guns. The Cicero police force has replaced its prohibition era “choppers” with space-age Colt Armalite AR-15 light machine rifles. Throughout the country, matter of fact, America’s 300,000 lawmen are taking a long look at their outdated arsenals. No wonder. With the AR-15 holding the spotlight of the show, Colt representatives are putting on special police demonstrations that really show what this new gun can do. I recently participated in one of them. Bill Murphy represented the Colt Co., and a group of top gunnery instructors from the Chicago police department were on hand. Sleek, Compact, and streamlined as a supersonic jet fighter, the rifle had the same sinister beauty as a coiled copperhead. The first surprise came when one of the officers picked up the rifle. “What’s it made of?” he gasped. “It’s light as a feather.” By extensive use of fiber glass and lightweight alloys, the designers held the rifle’s weight to an unbelievable 6 lbs., one-third the weight of the Thompson sub-machine gun. Unlike the Thompson and most other full-automatic weapons, the AR-15 can be controlled when it’s fired. Usually, the first few shots from a hand-held fully-automatic weapon hit the target and the rest go over it. The vicious recoil causes the gun to “climb” with each shot. To compensate for this, the usual technique is to let off a few shots at a time and reposition the gun between bursts. “There is your adversary, gentlemen,” announced Murphy. Fifty yards downrange stood a standard police silhouette target, the black shape of a man. Murphy slammed the rifle to his shoulder, squeezed the trigger, and in less than two seconds poured 20 shots into the target. Not at the target, but into it. Sixteen of the shots were in the “fatal” area, two were misses, and either of the other two would have put the man out of action. The design of the gun has practically eliminated “climb,” and the recoil is so slight as to be hardly noticeable. One-Handed Wonder. I tried the rifle and found it so light and easy to handle that I could hold it comfortably with one hand and fire short, accurate bursts (Fig. 4). 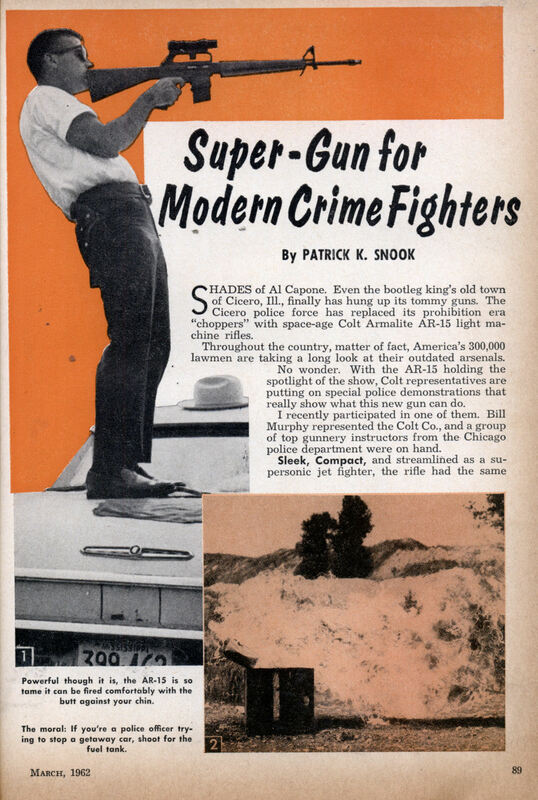 Murphy’s next move was to demonstrate that the versatile gun could save taxpayers’ money by replacing three of the four basic police special service weaponsâ€”the shotgun, gas gun, machine gun, and scope-sighted high power rifle. Occasionally, police are faced with a situation where a desperate fugitive holes up in a protected position and shoots it out. In a case like this, getting close enough for an effective shot means exposing an officer to deadly fire. This is when the call goes out for a police sharpshooter armed with a high-power, scope-sighted rifle. “Here’s another application that our rifle is tailor-made for,” said Murphy, as he slipped a small telescopic sight out of its case. 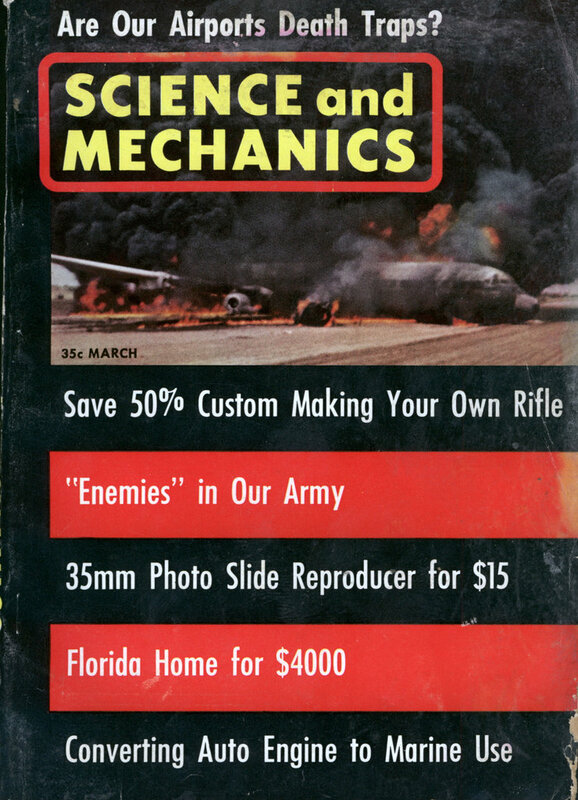 “The single screw mount on the scope not only means quick mounting, but keeps it accurately sighted in, no matter how often it’s taken off and refitted.” He flicked the fire selector to SEMI, converting the rifle to a single shot auto-loader, and proceeded to plant 20 shots so close together that the holes in the target, a hundred yards downrange, could be covered with one hand. “Well,” said Murphy, “seeing is believing.” We’d all noticed the old car that had been towed out to a far corner of the range. “Try that for size,” he said, as he handed the rifle to one of the officers. The instructor slapped in a loaded magazine, switched the fire selector to FULL AUTO, and let fly. Empty brass poured from the ejection port like peanuts from a can. We could see little spurts of dust rising from the bunker behind the derelict automobile several hundred yards away. We all had a try, and, in a matter of minutes, had expended close to 300 rounds. Car’s a Sieve. When we walked over to check the results, we found that the car now bore a striking resemblance to a sieve (Fig. 5). Where bullets had hit the door, they had done more than just penetrate. They had gone through the body paneling, window elevating mechanism, and inside metal work. Not only that, they had kept right on going and out through the opposite door. It was obvious that as a shelter or means of getaway, a car was no match for the AR-15. “A lot of brains, time, and money went into the development of this little cartridge,” Murphy remarked, “and if we weren’t darn sure it would do the job, we wouldn’t use it. Shattering Shock. While he was talking, Murphy set up a pair of 1-gal. tins. One he filled with water, the other with gasoline. “Now I’ll show you what hydrostatic shock does,” he said as he flicked off the rifle’s safety, and drew a bead on the first can. The AR-15 cracked, and the can disappeared momentarily in a geyser of spray (Fig. 6). Murphy now set up a 30-gal. oil drum and filled it with water. He handed the rifle to one of the instructors and told him to shoot at the lower half of the drum. The officer fired, and the drum flipped up into the air, its sides split and the bottom torn out. No Cleaning Needed. For the final demonstration, Murphy set up a large concrete building block (Fig. 3) that had been packed with hardened mortar. A quick burst, and the block vanished in a cloud of dust and flying fragments. We all looked at each other, and I had the feeling we all were thinking the same thing: Like the Model T Ford, the tommy gun was the ultimate in its day, but the time had come to replace it with this super-weapon. As the M-16 this weapon was notorious for troubles in the swamps and jungles of Vietnam for jamming. It took several years to work out the problems and cost lots of grunts their lives. The m16 is not the m15. When first introduced he m16 did not have a chromed barrel and would jam way too much because of that. also the lubricant on the bullets became sticky and would jam the gun further. The enviroment also sucked for this weapon. The cartrige still has its faults and should be redesigined, it lacks stopping power regardless of its hydrostatic shock. It will not knock a man over like the 7.62. In the June 1981 Atlantic magazine, James Fallows published “M-16: A Bureaucratic Horror Story.” It described how the Army’s ordnance department, feathers ruffled from having foisted the unworkable (too heavy a caliber) SKS assault rifle on NATO over the protests of the British and others, who wanted a light-caliber round similar to what the Germans and Russians had used effectively in WW II, sabotaged the AR-15 by inserting three requirements over the frenzied protests of its designer, a genius named Stoner at Armalite. The barrel twist had to be increased to improve accuracy 9but this halved lethality); the ammunition had to be changed to a dirty-burning compound from Olin (because it was similar to the powder used in other weapons); and an insertion-assist had to be added to force home recalcitrant rounds (this added zero to effectiveness, but increased cost and weight). The original weapon, which can be bought from Armalite, is as good as the article says. But the Army still wouldn’t back down from its mistaken specs, even after the hearings exposed the Ordnance dept.’s blunder. “The system” protects its own–and it recognized blood-brothers in the mediocrity and petty gamesmanship of the blunderers. Fallowsâ€™ article isnâ€™t available online yet, Fallows explains in his thread on the Atlanticâ€™s site that articles from that date have to be scanned in and are still in a legal limbo. But you can obtain it by interlibrary loanâ€”they may even make a free copy for you and mail it to you. Check with your library. My father wrote this article and I must say, I have just now read it. I am proud of all he did and all he wrote……this was just the beginning of his life of writing. If anyone is interested in anything more he wrote, they are welcome to contact me at [email protected]. The flaws of the military version, M16 are are well documented. These flaws were almost all of them the result of changes made by the military to the design and manufacture of the AR15 to adapt it to their specs and requirements. Roger Knights: The “SKS assault rifle on NATO”?? Are you kidding? I’m sure that you mean the 7.62mm NATO cartridge. The SKS of course being a Soviet rifle (but you knew that). NATO coiuntries adopted their own weapons to fire the 7.62 NATO (but you knew that too). I hope the article doesn’t put it that way. By the way the forward assist was an improvement on the action. Take it from someone who carried an M-16. Every previous infantry rifle had a means of pushing the bolt forward. neoatomica: Bullet shouldn’t be lubricated, it was the AR-15 NOT the M-15 (actually, the Squad Automatic Rifle version of the M-14 don’t you know). It’s a myth that bullets “knock people down” 7.62 or otherwise. Tim Tracy: A lot of the “flaws” that amateurs keep harping about were fixed a long time ago, but that doesn’t stop bloggers and even people in uniform from repeating them over and over.